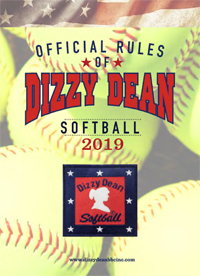 CHEATING is strictly prohibited in all DIZZY DEAN BASEBALL & SOFTBALL functions. 2. Farm League Rule 21:03 - Only 10 players on the field; must be 6 infielders inside the outfield line and 4 outfielders outside the outfield line until the ball is hit. 3. Common Rule 207:B - 5 & 6 year olds may use the USABAT licensing stamp specifically labeled for T-Ball, can be used by hitting a level 5 soft compression ball. The T-Ball bat cannot be used with a regulation ball, this is for league play only, all tournaments will be played with regulation ball and T-Ball Bats will be illegal. 5. Common Rule 609 - change wording in this rule from “pitcher toes the rubber in warm-up pitch” to “throws a pitch to a batter”. 6. If a pitcher reaches a day(s) of rest threshold while facing a batter, the pitcher may continue to pitch until any one of the following conditions occurs: (1) that batter reaches base; (2) that batter is retired; or (3) the third out is made to complete the half-inning or the game. The pitcher will only be required to observe the calendar day(s) of rest for the threshold he/she reached during that at-bat, provided that pitcher is removed or the game is completed before delivering a pitch to another batter. Rule Interpretation: Intentional walk will add 4 pitches to the pitch count. 2. Farm League Rule 21:04 - Only 10 players on the field; must be 6 infielders inside the outfield line and 4 outfielders outside the outfield line until the ball is hit. 4. Freshman Division Rule 3:07 - If an EP is used all ten (10) must bat and any nine (9) of those ten (10) may play defense. When a rule is not covered in these sections refer to the National High School Federation rules. 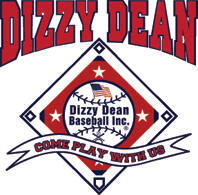 Dizzy Dean Baseball, Inc. strongly recommends that all teams/leagues adopt and implement a concussion risk management program that keys in on training and education for staff, parents, and players in the areas of understanding concussions and their impact on health; recognizing concussion signs and symptoms; removal from play; and return to play protocol. Such a program normally includes web video training for staff and the distribution of an information sheet each season to all staff, parents, and players. Guidelines for developing a plan are available on the Dizzy Dean website. 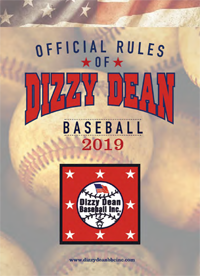 Dizzy Dean Baseball Inc. © Copyright 2019 No part of this site may be reproduced without written consent.